Introducing the 25th Anniversary Edition of New York Times Bestseller "Silent Coup"
“Silent Coup“ Tapes Reveal Major Woodward “Lie”. Watch Len Colodny Expose That Woodward Has A “Secret Life”. 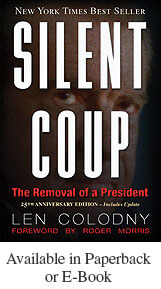 "Silent Coup" contains exclusive new material gathered from hundreds of interviews, from still-unreleased government documents, from the complete Oval Office logs of Nixon's presidency, and from a painstaking cross-examination of the books and testimony of the major and minor players in the story. The result is a major revision of history, one that will forever change our understanding of how and why Richard Nixon was forced to resign. "Silent Coup" is accepted by all shades of the political spectrum. "Who, What, Why" website Author, "Family of Secrets"
Enterprise Editor, USA Today Author, "Nixon's Gamble"
From Nixon to Trump Author, "Nixon's Secrets"